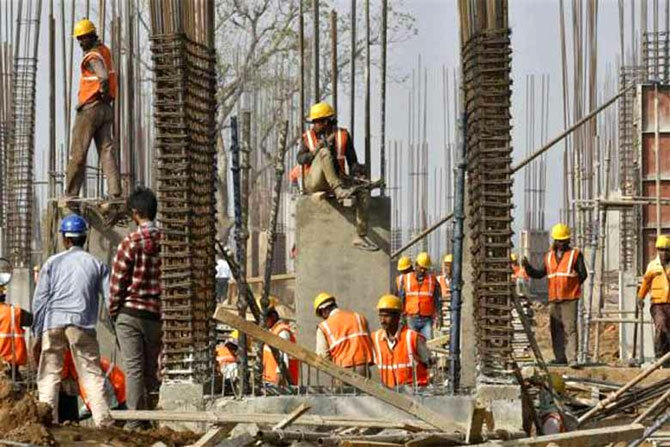 India’s GDP growth is estimated to slow down to 7.1 per cent in the current fiscal, from 7.6 per cent in 2015-16, mainly due to slump in manufacturing, mining and construction sectors, government data showed, on Friday, without factoring in the 'volatile' post-demonetisation figures. Releasing the data compiled by the Central Statistics Office (CSO), chief statistician T C A Anant said the figures for November were available and examined but "it was felt in view of the policy of denotification of notes that there is a high degree of volatility in these figures and conscious decision was taken not to make a projection using the November figure". Accordingly, the 'First Advance Estimates of National Income, 2016-17' did not reflect the impact of demonetisation, effected on November 9 for ban of old Rs 500/1,000 notes, and are based on sectoral data for only seven months or till October. Real GDP or Gross Domestic Product (GDP) at constant (2011-12) prices in the year 2016-17 is likely to attain a level of Rs 121.55 lakh crore, as against the Provisional Estimate of GDP for the year 2015-16 of Rs 113.50 lakh crore, released on May 31, 2016. "The growth in GDP during 2016-17 is estimated at 7.1 per cent as compared to the growth rate of 7.6 per cent in 2015-16," the CSO said. The CSO projections on national income are now in line with the Reserve Bank's estimates, which too has lowered the GDP growth prospects to 7.1 per cent. "Anticipated growth of real GVA at basic prices in 2016-17 is 7 per cent against 7.2 per cent in 2015-16," the CSO said. In value terms, the Gross Value Added (GVA) at constant prices is anticipated to increase from Rs 104.27 lakh crore in 2015-16 to Rs 111.53 lakh crore in 2016-17. As per data, performance of the all sectors, excluding 'agriculture' and 'public administration, defence and other services' are expected to expand by 4.1 per cent in 2016-17 from 1.2 per cent. On the other hand, mining and quarrying is likely to shrink by 1.8 per cent after recording a growth a 7.4 per cent in 2015-16. Growth in manufacturing is expected to slow to 7.4 per cent (from 9.3 per cent) and construction activities to 2.9 per cent (from 3.9 per cent). As per the data, the per capita net national income (current prices) during 2016-17 is estimated to be Rs 103,007 showing a rise of 10.4 per cent as compared to Rs 93,293 during 2015-16 with the growth rate of 7.4 per cent.